Each typographic artwork examines expressions regularly used in both cultures, highlighting that though the translation may not be literally identical, the meaning is generally the same. 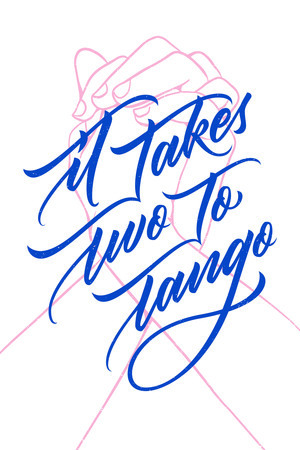 For example, Korean typeface studio Yang-Jang & Bazbon (양장점) and New York-based calligrapher Margaret Fu were paired up to explore the phrase, "It takes two to tango." (손바닥도 마주쳐야 소리가 난다.) 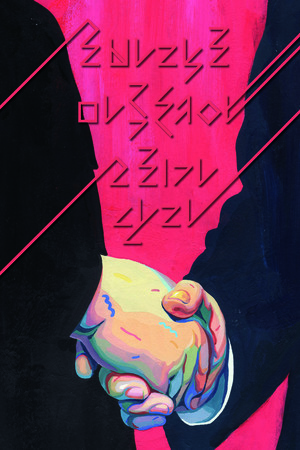 Yang-Jang & Bazbon's work shows a close-up of two men in black suits shaking hands against a red background, the whole creating a very Big Brother, almost menacing vibe. Written in slashing Korean characters, the expression back translates into English as "It takes two hands to make a clap," suggesting that cooperation helps get things done. Meanwhile, Fu's artwork also shows two hands, though intertwined in a dance-like embrace, with flowing, graceful script spelling out the phrase. The American's representation is a more literal take on the the expression. Additionally, a pair of artists was commissioned to create works inspired by "the progress for peace and harmony on the Korean peninsula."